Director General of Health Services has posted an advertisement on Ministry of Health & Family Welfare, Government of India website for recruitment of Doctors for posts of Senior Residents in various departments of Lady Hardinge Medical College (LHMC) and associated hospitals. Posts: Total no. of posts is 143 in various departments. 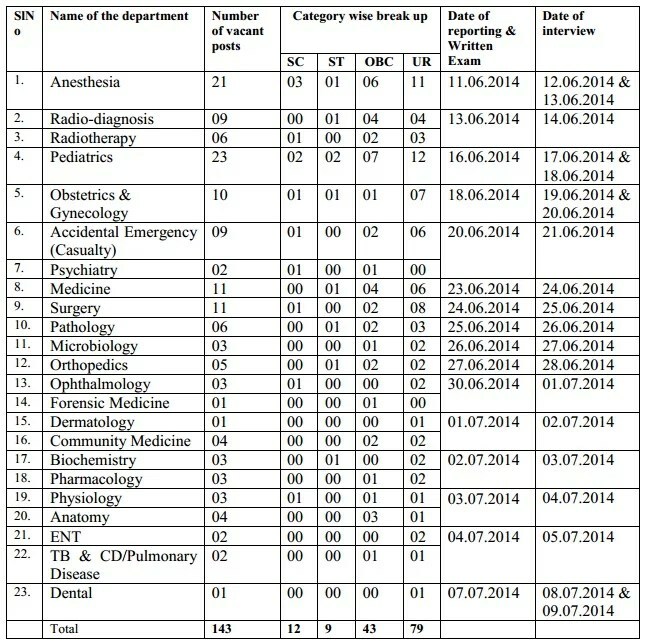 Posts are in Anaesthesia, Radiodiagnosis, Radiotherapy, Pediatrics, Obstetrics and Gynaecology, Accidental Emergency (casualty), Psychiatry, Medicine, Surgery, Pathology, Microbiology, Orthopaedics, Ophthalmology, Forensic Medicine, Dermatology, Community Medicine, Pharmacology, Biochemistry, Physiology, Anatomy, ENT, TB Chest and Dental departments. Important Dates: Date of reporting and written exam will be between 11/06/2014 to 07/07/2014 depending on department. Date of interview (walk-in) will be between 12/06/2014 to 09/07/2014 depending on department. Candidates should report at 10:00 am on notified dates. Age Limit: Age of the candidate should be less than 33 years on date of registration, which is relaxable by up to 5 years for SC/ST candidates and upto 3 years for OBC candidates. Eligibility/ Qualifications: MBBS with PG Degree/ Diploma in concerned speciality from recognized university. For SR in Accidents and Emergency departments – MBBS with PG Degree/ Diploma in Medicine/ Surgery/ Forensic Medicine/ Orthopaedics from recognized university.